I used to make this with tortillas or flat breads. I had never thought of trying it without, but I was really wanting it, so I decided to give it a try. I thought it was fine without the tortillas. Brown ground turkey on the stove – cook all the way through. Place 1/3 cooked meat in the bottom of an 8 x 8 baking dish. 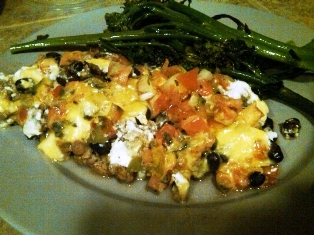 Layer with half the beans, 1/2 the yogurt, 1/3 the pico de gallo, and 1/4 cup of the cheese. Repeat. 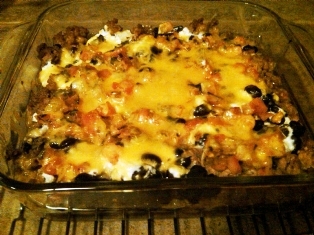 Add the last third of the meat on top, cover with the remaining pico de galla and cheese. This sounds super delicious! Have you tried the SCD taco shells to use as a tortilla replacement (the kind that is baked provolone cheese slices). They are so great! Crunchy and tasty! I don’t believe that a person can go wrong with baked cheese. 🙂 Thanks for the fantastic recipe. I have been meaning to try making taco shells with Provolone but I haven’t yet. Usually I use butter lettuce leaves for tacos (new taco recipe coming this week). I love baked cheese though, so I do want to give the Provolone a try. I loved this recipe! I made a few changes/additions and my family ate it up! I seasoned the meat (I used ground chicken) with some salt, cumin, and chili powder for additional flavor. I also shredded some lettuce to put on top after cooking, along with extra pico de gallo, as well as sliced scallions. It was a little watery, but very tasty! Thanks for the recipe.